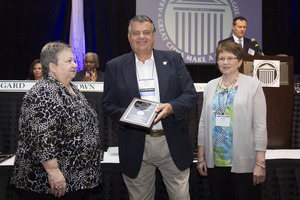 The Arkansas Municipal League at its 81st Convention, held June 24-26 in Little Rock,honored Mayor Dennis Behling with the Adrian L. White Municipal Leadership Award. The award was presented during the Awards and New Officers’ Luncheon by 2014-2015 League President and LittleRock Mayor Mark Stodola. The Adrian White award is given to municipal officials who have served with distinction and dedication to the League’s boards,councils, or committees for six years. The award is named in honor of White, who was mayor of Pocahontas from1967-1974 and a former League president and vice president. The Arkansas Municipal League is a service and advocacy organization for the municipalities of Arkansas.The League has a voluntary membership comprised of all 500 cities and towns in the state and was created to assist cities with information and representation in the public affairs of our state and nation. To find out more, please visitwww.arml.org.